Kimchi is a Korean cuisine staple made from fermented vegetables like napa cabbage and radish. This probiotic powerhouse is the star of our Kimchi Fried Cauli-Rice. Not only does Kimchi add a slightly spicy-sour flavor to this dish, but it also adds important nutrients, like vitamins A & C and fiber. 1. Heat oil in a large pan over medium-high heat. Once hot, add onion and garlic. Cook, stirring occasionally, until onions start to become translucent. 1. Add kimchi to pan. Cook, without stirring, for 3-5 minutes or until kimchi just starts to brown. 1. Stir in optional ground pork, cauliflower crumbles and soy sauce. Cook, stirring occasionally, for 3-5 minutes or until cauliflower is tender and warm, but not mushy. 1. Push cauli-rice mixture to the edges of the large pan to create a well. Place whisked eggs into the center of the well and cook for 2-3 minutes before scrambling and stirring into mixture. Remove from heat. 1. 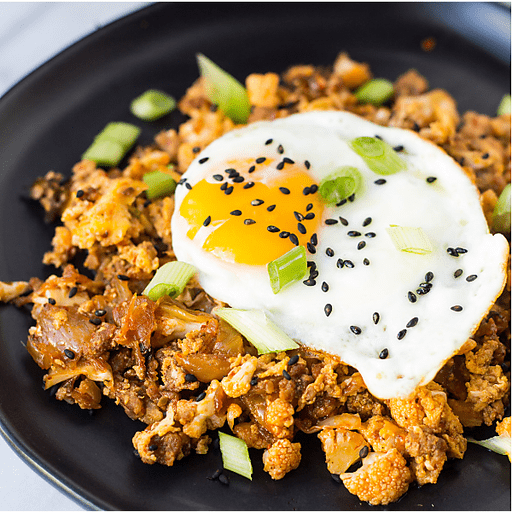 Stir in optional toasted sesame oil and top with optional fried eggs, green onions and sesame seeds. Serve warm. Top with toasted sesame oil, fried eggs, sliced green onions and sesame seeds. Although we've created this dish with cauli-rice (or crumbled cauliflower) for an added veggie boost, feel free to substitute cooked rice instead. For gluten free: Use tamari or coconut aminos in place of soy sauce. Calories 150, Total Fat 11g (Saturated 1.5g, Trans 0g), Cholesterol 140mg, Sodium 610mg, Total Carbohydrate 6g (Dietary Fiber 2g, Sugars 2g), Protein 7g, Vitamin A 4%, Vitamin C 45% Calcium 6%, Iron 10% *Nutritional values are an approximation. Actual nutritional values may vary due to preparation techniques, variations related to suppliers, regional and seasonal differences, or rounding.